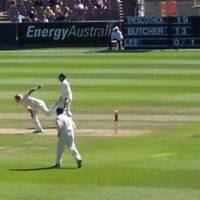 Brett Lee in delivery stride at the MCG today. Today was spent at the MCG, on the second day of the Boxing Day Test. My brother, my nephew and I spent a delightful day soaking up the atmosphere, enjoying some fine batting (especially Justin Langer and Martin Love) and some fine bowling (each of McGrath, Gillespie, MacGill and Lee were in dangerous form). The fact that all of the good performances were from the one team meant that the competition was not as balanced as you would like, but you can’t ask for everything. Going to the cricket live is a very different activity to simply watching it on TV or listening to the radio. It’s more of an activity for one thing. You get to choose what you’ll focus your attention on, and, in some ways, there is much more information available to you than when watching it on the box – despite the manifold graphs and charts and tables you find on the TV. In the crowd you hear the reactions of the rest of the crowd. You feel just how fast the bowling is (at least, Brett Lee at 150km/h) and how skilled the reactions of the batsmen are. We were watching from roughly side-on in the Olympic Stand (at around 8 o’clock on the dial) and you get a very good impression of just how far back the wicketkeeper stands when facing a fast bowler. It was fun. I’ll do that again.